The SkyPark Link is Malaysia’s second airport rail link, providing an express service between KL Sentral and Subang SkyPark through the new Terminal SkyPark station. This new limited-stop service only makes one intermediate stop at Subang Jaya, before taking the new branch line to Terminal SkyPark. You are advised against taking the Skypark Link TO Subang Airport as in the event of unforeseen train delays or cancellations, you are required to wait for the next train in up to 2 hours later. How do I book SkyPark Link tickets online? 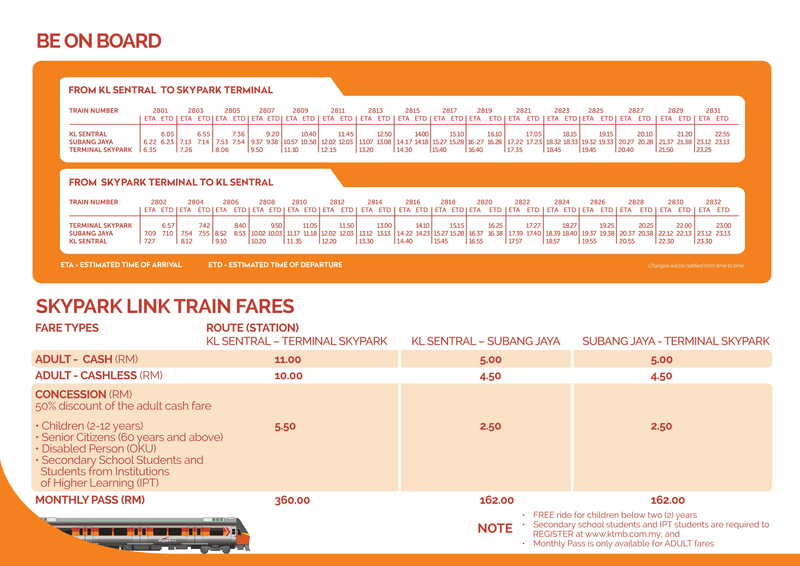 You cannot book SkyPark Link tickets online. How do I buy SkyPark Link tickets from KTM Komuter Klang Valley Sector stations (other than KL Sentral and Subang Jaya) to Terminal SkyPark station? If you are using a cash token (concession only): You may change to the SkyPark Link at KL Sentral or Subang Jaya. However, you have to exit the station with your KTM Komuter Klang Valley Sector token and buy another SkyPark Link token from the ticket counter. Adults must use a Touch ‘n Go or Komuter Link card for travel on the KTM Komuter Klang Valley Sector. If you are using Touch ‘n Go or Komuter Link: You may change to the SkyPark Link at KL Sentral or Subang Jaya. You need to tap out of KL Sentral or Subang Jaya station from your KTM Komuter Klang Valley Sector trip and tap in again at the respective fare gates to travel on the SkyPark Link to ensure correct fare deduction. How do I buy SkyPark Link tickets from Terminal SkyPark station to KTM Komuter Klang Valley Sector stations (other than KL Sentral and Subang Jaya)? If you are using a cash token (concession only): You may change to the KTM Komuter Klang Valley Sector at KL Sentral or Subang Jaya. However, you have to exit the station with your SkyPark Link token and purchase a new KTM Komuter Klang Valley Sector token. Adults must use a Touch ‘n Go or Komuter Link card for travel on the KTM Komuter Klang Valley Sector. If you are using Touch ‘n Go or Komuter Link: You may change to the KTM Komuter Klang Valley Sector at KL Sentral or Subang Jaya. You need to tap out of KL Sentral or Subang Jaya station from your SkyPark Link trip and tap in again at the respective fare gates to travel on the KTM Komuter Klang Valley Sector. The SkyPark Link operates with a dedicated fleet of four sets of 83 Class EMUs with a SkyPark Link livery and interior.